LOS ANGELES, Nov. 8, 2018 /PRNewswire/ -- With over 100,000 "Likes" on Facebook, Easy Breathe, the online CPAP store, is the most liked CPAP retailer on the internet. Easy Breathe's engaging Facebook page solidifies the company's leadership in CPAP retail and the larger sleep apnea community. 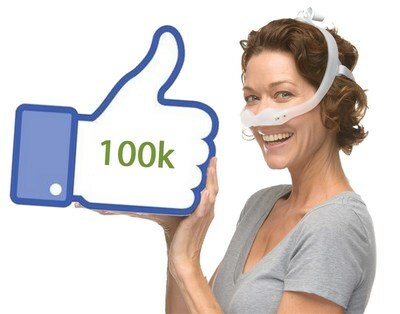 Easy Breathe's Facebook page compliments its online CPAP store, giving visitors a wealth of information about promotions, sweepstakes, and product features. People can also find tips on CPAP therapy and supply maintenance. By supporting the CPAP community on Facebook, Easy Breathe is more than a retailer; it's a trusted advisor to the millions who deal with sleep apnea nightly. "We want to create a platform for engagement in the CPAP community," said Nick Weiss, Easy Breathe founder and CEO. "We strive to ensure that our customers are aware of the best deals on cutting-edge products and the most useful CPAP tips and tricks. For our team, this Facebook milestone definitely shows we are connecting with the community and moving in the right direction." Working with Insurance: Highly-trained customer care specialists review insurance plans and provide exact quotes-- at no additional cost. Prescriptions Made Easy: No doctor? No problem. With Easy Breathe's unique prescription package, sleep apnea sufferers who are between doctors can get a prescription in less than 2 business days.